When a soldier is wounded on a battlefield, or someone suffers trauma in a remote location, it is critical to remove dirt and other debris before the wound is packed, in order to prevent infection. The standard approach is to use a syringe to flush the wound with saline solution. But a team of UR biomedical engineering students believe they’ve come up with a far more effective approach. And the start-up company that sponsored them couldn’t be happier. 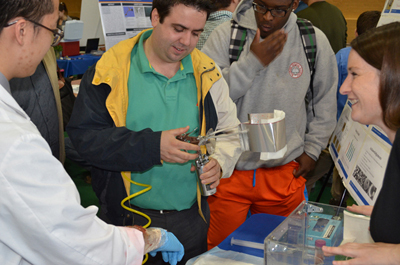 The “Airbrasion” team created a prototype wound debridement system that uses air jets and antiseptic silver microparticles to remove debris and necrotic tissue to promote healing. The senior design project of Allayna DeHond, Hyun Jin Kim, Caitlin Koski, Matthew LeVasseur and Kevin Wong, supervised by Dean Johnson, all of the Department of Biomedical Engineering, was sponsored by Dan Eversole, Co-founder and CEO of NanoPulse Biosciences LLC of Boston. NanoPulse develops high quality nanoparticles for use in the area of in vitro diagnostics. Eversole is a 2004 graduate of the BME department. The project is an example of the collaboration the Hajim School of Engineering and Applied Sciences encourages between its senior design teams and outside clients. Students benefit from the opportunity to apply their skills for “real-life” projects and customers; businesses and other clients benefit not only from what the students produce, but the opportunity to interact with them and potentially recruit them. Companies interested in collaborating on Senior Design Projects are encouraged to contact James Zavislan, Associate Dean, Education and New Initiatives. Click here to read more. 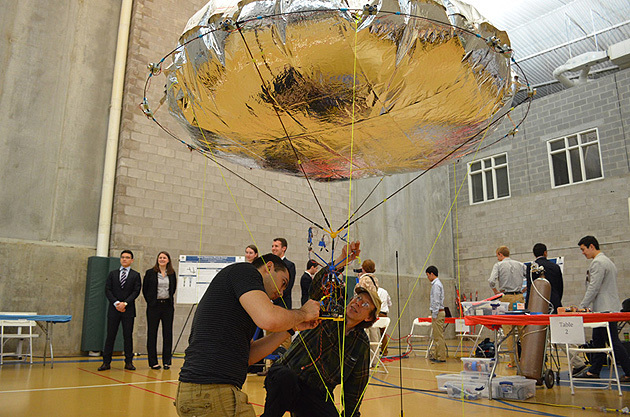 The Airbrasion device got a lot of attention when 62 Hajim School senior design projects were on display for Design Day 2014 in the Goergen Athletic Center Field House. Wong taped to his forearm simulated wounds that the students devised, which could then be sprayed with liquid matching the viscosity of blood and packed with grit and sand to simulate a traumatic injury. Visitors were then invited to operate the device, which consisted of a portable air gun and nozzle that could direct just the right mix of air, water and silver particles, at just the right air pressure, to cleanse the wound without compounding the injury. “They were a very interactive team; they [responded] to anything we were suggesting,” Bourgeois said. He was especially impressed by the initiative the students showed in coming up with a realistic wound model, taking care to ensure it had the same elasticity as human skin. The prototype at this point “may look ugly to an outside person, but it is beautiful to us,” Eversole added. The goal was to come up with something that would be “cheap and easy to assemble in the field,” Eversole said. And that’s exactly what the students delivered – using only about 40 to 50 percent of their $400 budget. “This is definitely something we can pick up and take forward.” The students said they appreciated the opportunity to work with NanoPulse. “This is the most applicable thing that we have learned in our college career, being able to communicate with these companies and work with customers in real world applications,” Koski said.